The properties damaged by DUIs in Los Angeles can include everything from vehicles to homes to businesses and retail establishments. Sometimes a DUI driver will take out a neighborhood landmark, destroying a bar or a restaurant that’s a favorite with locals. Residents and regular visitors to Dewey Beach, Delaware, are mourning the destruction of Ed’s Chicken and Crabs by a DUI driver. 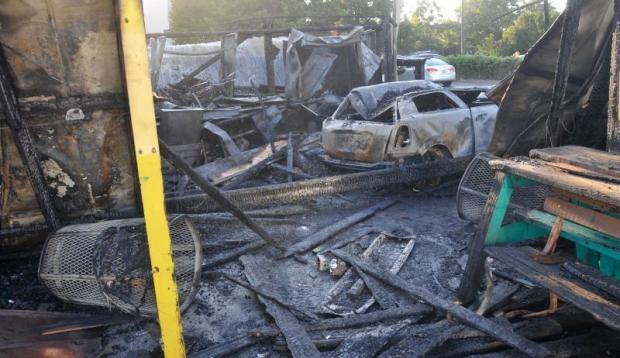 A 2013 Mini Cooper driven by Michelle Small, 36, of Wyoming, Delaware, slammed into the popular summer take out restaurant, hitting a propane gas tank and igniting a fire that soon engulfed the building. A video camera on a nearby building recorded the entire incident, which occurred around 2 a.m. The video shows Small’s vehicle traveling southbound at a high rate of speed along Route 1 (the Coastal Highway). The car crosses over the median strip, goes about a half block the wrong way in the north lanes and then crashes into the restaurant. Fortunately for Small, Dewey Beach’s reputation as a party town usually means that there are a fair number of police officers on hand to keep an eye on people leaving the bars in the early morning hours. Three officers saw the crash and ran to the vehicle, broke open a window and extracted the woman from the car before the fire broke out. The police later charged her with DUI. 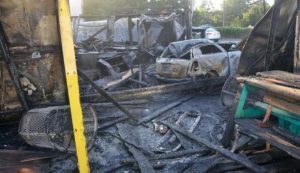 The fire completely destroyed the 45-year old restaurant, and the 83-year-old owner said he won’t rebuild. If Small’s crash had occurred in California, she’d be looking at increased penalties for her DUI offense. Under California Vehicle Code 23582, driving in a reckless manner and traveling at speeds of more than 20 to 30 miles over the speed limit adds jail time. For a first-time DUI offender, that could mean a minimum of 60 days in jail.